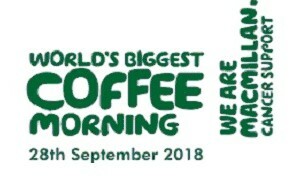 Once again, Cranleigh Rotarians played their part in the world's biggest coffee morning, held on behalf of MacMillan Cancer Care. The event took place in the Guide Hall in Village Way on Friday, 28 September. A light lunch of soup and filled rolls was provided, whilst a variety of cakes was available to munch with the tea and coffee. "The weather was kind to us and many sat outside enjoying the late summer sunshine, as well as eating cake and drinking coffee," said Rotarian Jane Briggs. "We were delighted to collect £170 from the refreshments, with an additional £150 from the raffle. A further £30 was added by the Club, bringing the total to £350. This will be sent to the Macmillan Cancer Care charity to support their work with cancer sufferers."